Sorry we’re a little late today, but we had breaking news on The Hukilau to post. 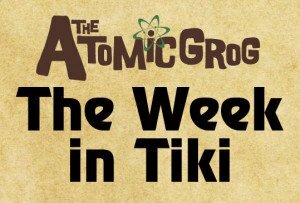 Enjoy your Week in Tiki! * The Tiki Tower Takeover features four of the country’s top barmen – Jeff Beachbum Berry (Latitude 29, New Orleans), Martin Cate (Smuggler’s Cove, San Francisco), Paul McGee (Lost Lake, Chicago) and Brian Miller (Tiki Mondays with Miller, New York City) – as they each serve up a cocktail in the revolving Pier Top Lounge on the 17th floor of the Pier 66 hotel on the Fort Lauderdale’s Intracoastal Waterway. This special event takes place on Thursday, June 11, at 4 p.m. Tickets are $69. A vintage photo of Dawn Wells during the ‘Gilligan’s Island’ heyday in the 1960s. She’ll taking a three-hour cruise with The Hukilau villagers in June. * And announced for the first time: The Hukilau welcomes a very special guest – actress Dawn Wells from Gilligan’s Island – for a “Three Hour Tour” Cruise on Fort Lauderdale’s inland waterways. Limited to 300 people, the cruise aboard a yacht will include open bar, food, Tiki tunes and more. The event is set for Friday, June 12, at noon. Tickets are $99 if you buy a wristband pass for The Hukilau, $149 without a pass. The Hukilau’s new website is now live with complete coverage of the event, including a daily schedule, entertainer and band profiles, bartender bios, full details on all the symposiums, plus lots more. 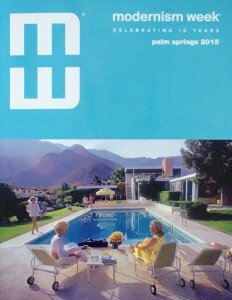 The world’s premiere event that celebrates the appreciation of mid-century architecture and design marks its 10th anniversary this week in Palm Springs, the cradle of the 20th century’s grand vision of modern living. Modernism Week – an annual celebration of art, fashion and culture – features more than 200 events, including the Modernism Show, home tours, films, lectures, double-decker bus tours, parties, walking and bike tours, vintage fashion, live music, and more. Sold-out events include walking tours of neighborhoods made famous by Frank Sinatra and the Rat Pack, plus architectural bus tours. One of the centerpiece events is the Modernism Show & Sale, running Friday through Sunday at the Palm Springs Convention Center. It features 85 dealers offering a huge assortment of mid-century modern furniture, decorative and fine arts objects. Tiki and mid-century modern art lovers will also not want to miss several free events at Shag: The Store, home base for artist Josh Agle (see Artist of the Week profile below). On Friday (Feb. 13), catch a release party for a new Shag print featuring music by The Martini Kings. On Saturday (Feb. 21), you can meet the artist at his Palm Springs store. Modernism Week is also a charitable organization, providing scholarships to architecture and design students, as well as supporting local and state groups that strive to preserve modernist architecture throughout California. The Disney Parks Blog has provided a sneak preview of the drink menu at the upcoming Trader Sam’s Grog Grotto at Disney’s Polynesian Village Resort. According to the Tuesday (Feb. 3) blog post, there will be at least five new drinks plus more than three drinks coming over from the Trader Sam’s menu at Disneyland. Exclusive to Disney World will be Castaway Crush, the Polynesian Pearl, the Nautilus, the Dark & Tropical Stormy, and the Tahitian Torch. Shared with Trader Sam’s Enchanted Tiki Bar will be the Shrunken Zombie Head, Krakatoa Punch, Uh-Oa! and “many more,” according to the blog. We’re also assured that Trader Sam’s “head” beverage crafter is “concocting new handcrafted cocktails made with authentic premium ingredients in souvenir drink vessels.” [See: Mugs | Menu] A reliable source also tells us that the Grog Grotto will use the same high-quality tropical drink syrups as Trader Sam’s in Disneyland: the B.G. Reynolds brand. A photo of the stolen Smuggler’s Cove war club posted on Facebook. 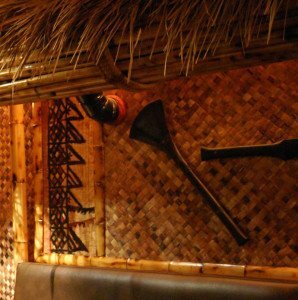 Smuggler’s Cove in San Francisco, acclaimed as one of the top bars in the world (Tiki or otherwise), was the victim of a theft last week of a one-of-a-kind decorative war club. Owner Martin Cate says he thinks a drunk patron yanked it off the wall and smuggled it out of the bar. The wooden hand-carved Fijian war club was carved by Georgia artist Basement Kahuna. It’s among the many rare and specially made Tiki and nautical items that cover every wall of the 5-year-old bar. Employees are scouring eBay and Craigslist, and they ask that anyone who sees such a piece for sale to contact them. When the Conga Lounge opened in the bar space above the pizza restaurant Cafe Rustica in 2003, the Tiki revival was not firing on all cylinders like it is today. Opening a Tiki bar, even in the Bay Area where Trader Vic created the Mai Tai, was a risk by the owners, Michael “Conga Mike” and Manny Thanos. But the bar was a success, and it inspired the Thanos brothers to join forces with mixologist extrordianire and fledgling owner Martin Cate to open Forbidden Island in Alameda in 2006. Cate left to open Smuggler’s Cove in 2009, but Forbidden Island is still thriving as one of the of best examples a modern neo-Tiki bar. The cozy Conga Lounge never achieved such fame, but it continued to serve the Oakland area with its menu of 40 tropical drinks, including the signature Gilligan’s Island cocktail, for more than a decade. Saturday, Feb. 21, is scheduled to be the restaurant’s final day in business. The restaurant and bar, including the liquor license, are for sale. According to the article quoted above, the space is in a desirable location in “a unique, historically significant modernist two-story building.” Let’s hope it lands in good hands. Interested buyers can click here for more info. Josh Agle, the California artist better known as Shag, is perhaps the most acclaimed contemporary artist specializing in mid-20th-century themes that transport you back to a more colorful – and wildly hip – time. 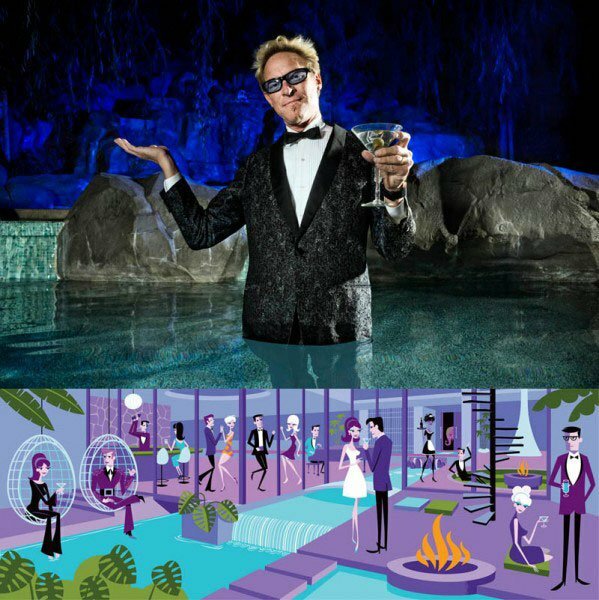 His art conjures up a unique parallel universe dominated by swanky cocktail parties full of surreal characters and ubiquitous Tikis. He’s also well known for his work for Disney, particularly his Enchanted Tiki Room prints. In honor of Modernism Week, Shag will be releasing a new serigraph print, “The Ensuing Elephant,” on Friday (Feb.13) [More info] Next Monday (Feb. 16), the Palm Springs restaurant Tinto is hosting an intimate dinner with Shag, featuring modern cuisine by Iron Chef Jose Garces. Reserve a seat now before they sell out. Finally, his Palm Springs store will host a meet-and-greet on Saturday, Feb. 21. It’s a great week to get your Shag on. 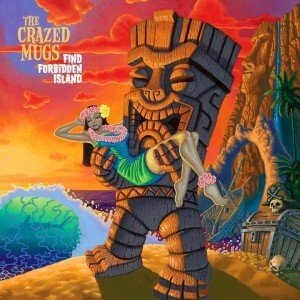 The Zen Tiki Lounge is the longest-running podcast focusing on the Tiki, island and mid-century modern lifestyles. Make yourself a cocktail and tune in to the freewheeling shows hosted by Sunshine Tiki, Starshine and Kalani, and you’ll swear you’re a fly on the wall at the craziest Tiki cocktail party. You can stream the podcast directly from the website or subscribe via iTunes. The latest episode (No. 322) is a romantic adventure with exotic lounge music and a Tiki drink perfect for Valentine’s Day. Like the podcast, the site is all about the cocktails. 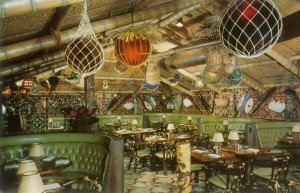 You’ll find a voluminous archive of recipes, many of them Zen Tiki Lounge originals. In addition, there’s a web store, photos, an event listing, and more. A postcard from the original Trader Vic’s at the Savoy Hilton in New York City. New York City’s Tiki scene has had a tumultuous recent history, with bars and restaurants opening and closing at a regular pace, but few gaining iconic status. During Polynesian Pop’s mid-century heyday, however, Trader Vic’s was the go-to spot in the Big Apple for more than 30 years. Originally in the Savoy Hilton on East 58th Street from 1958 to 1965, the venerable bar and restaurant hosted such regulars as Bob Fosse and Stanley Kubrick, who allegedly first discussed his idea for 2001: A Space Odyssey there. When the hotel was demolished in 1965 to make way for the General Motors Building, Trader Vic’s moved across the street to the Plaza Hotel, where it remained until 1989. Legend has it that Salvador Dali ate lunch there every day when he lived in the Plaza, sometimes with Andy Warhol. The restaurant’s most striking feature was the 40-foot outrigger canoe used by Marlon Brando in the movie Mutiny on the Bounty. All this history was apparently beyond the comprehension of the Plaza’s new owner, Donald Trump, who closed it when he bought the building. The space beneath The Plaza now houses Todd English’s food court. 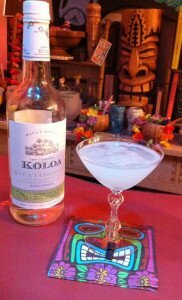 Spiced or flavored rums are usually not taken seriously by rum connoisseurs, but an exception to the rule is the outstanding coconut rum made by the Koloa Rum Company in Hawaii. Introduced in 2013, it won the gold medal for best in class flavored rum at the 2014 Miami Rum Renaissance Festival, where I first tasted it. It immediately stands out from the mediocre coconut rum crowd with its full 80-proof strength and robust flavor that reminds you of fresh coconut, not artificial ingredients. Koloa’s rums are hand-crafted from Hawaiian sugarcane and Kauai’s pure water sources. If you visit the island, check out the tasting room next to the company store. Shake well with ice cubes. Strain into a chilled cocktail glass. Garnish with a lime peel speared to a slice of coconut. Berry is best known for his outstanding books on Tiki cocktail history, plus his new Latitude 29 bar and restaurant in New Orleans. And while this simple cocktail doesn’t appear on the bar menu, it’s a nice showcase for coconut rum. It’s also something you might want to whip up for Valentine’s Day instead of all those cloyingly sweet drinks you may see suggested elsewhere. The combination of lime, chocolate and coconut immediately takes you to the islands. In Remixed, the 2009 book in which the recipe appeared, Berry says he came up with the drink in 2005 while trying to combine chocolate and coconut in a cocktail. The result is a streamlined yet flavorful drink that can easily become addictive. A good rum and liqueur are essential, however. I prefer a quality creme de cacao (the Marie Brizard brand is good) rather than a cheap store brand. And hopefully you’ll be able to find a bottle of Koloa Coconut to give the drink a great punch of flavor and slight heat. If not, avoid that ubiquitous coconut rum in the white bottle and check out some of these other options rated by blogger Josh Miller of Inu a Kena in his Coconut Rum Challenge. Note that he reviewed Koloa’s rum after the challenge, moving it to the top of the coconut heap. 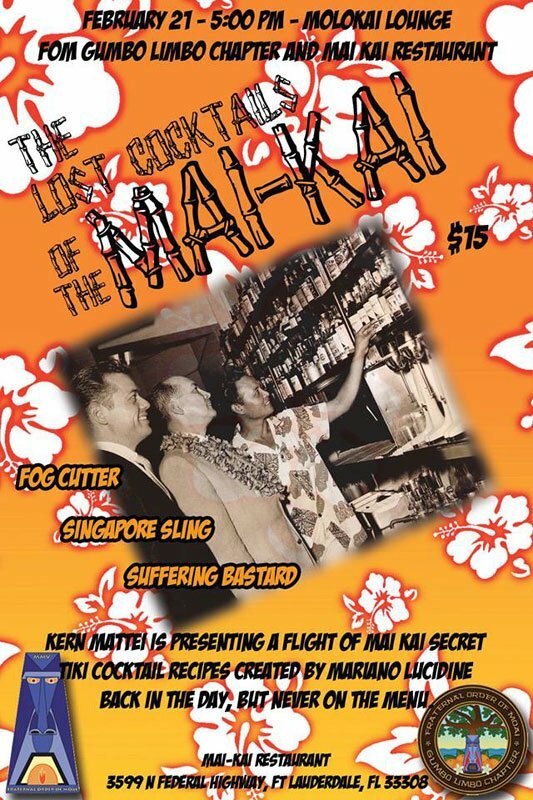 Don’t miss Berry at The Hukilau in June, where he’ll be participating in several events: A symposium on the history of the Planter’s Punch; and a special “Tiki Tower Takeover” at the top of the Pier 66 hotel, where he’ll join fellow barmen Martin Cate (Smuggler’s Cove, San Francisco), Paul McGee (Lost Lake, Chicago) and Brian Miller (Tiki Mondays With Miller, New York City) as they each shake up a signature drink during a special two-hour happy hour. Check out our latest event preview. 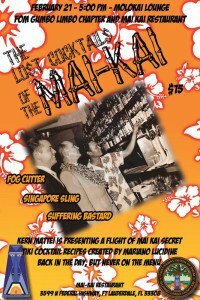 * Feb. 21 – Lost Cocktails of The Mai Kai, Fort Lauderdale. 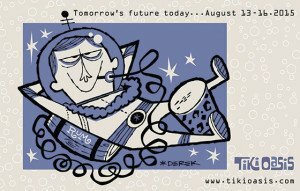 This entry was posted in Art, Cocktails, Culture, Disney World, Events, Events, History, Music, Other Florida, Recipes, Resorts, Reviews, Rum, South Florida, The Week in Tiki and tagged Beachbum Berry, Brian Miller, Conga Lounge, Crazed Mugs, Dawn Wells, Disney's Polynesian Village Resort, Hukilau, Josh Agle, Koloa Coconut, Koloa rum, Martin Cate, Modernism Week, Palm Springs, Paul McGee, Pier 66, Polynesian Resort, Restless Native, Shag, Smuggler's Cove, Tiki Tower Takeover, Trader Sam's Grog Grotto, Trader Vic's, Zen Tiki Lounge. Bookmark the permalink.